Back in ’31, the job was just supposed to be another bank heist - in, then out, then we'd be rich. But along with the money, we found that cursed ruby, and nothing was the same again. I’d thought about that gem every night for years, but now, in this bar with this dame looking at me all innocent and beautiful, I told her my tale. And that's when our story began. D. Alan Lewis mixes the hard-boiled P.I. genre with the darkest elements of the paranormal to create the Voodoo Rumors stories. Set in 1950s Nashville, Thomas Dietrich is cynical yet idealistic; amorous yet full of despair. He’s a man capable of harsh violence and unfettered compassion in a world where the darkest things walk the streets of his city at night. Just love those 1940s & 50s books & movies that begin with a down & out guy meeting a beautiful mysterious dame in a bar. Murdoch is just the voice for Thomas, kind of like Bogart in Casablana . . . "Of all the gin joints in all the towns in all world, she walks into mine." Enjoyed the way Murdoch did a woman's voice, not high, squeaky or unnatural. Also did very convincing voices of all characters, which brought them to life, more so than reading the book. Quite graphic descriptions of gory deaths. But they mostly deserved it. Will listen to other Alan Lewis books on tape, and especially books narrated by Pennington. loved the narrator, changing voices instead of just reading made it a very enjoyable listen . I adored the old Nashville ties and the wonderful character development. This is not something I would have normally chosen, but overall it was done well and I enjoyed it. Thanks! Good performance, rather basic story. Going into this book I was unsure of what to expect. 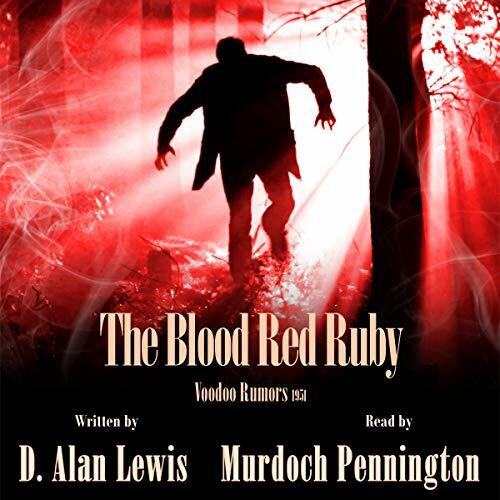 While I would consider the story generic, though I found the writing engaging enough I forgot I was listening too an audio book for most of the duration; I enjoyed the excursion into the world of the ruby. the narrator did a fantastic job as well. Consistent throughout with the voices. I found them very easy to listen too and used a very appropriate tone for this story and pacing. Outside of one character later introduced into the book, I was very happy with the overall performance and look forward to listening to more of his work. The narrator immediately had me with his voice and I have to say that the performance was wonderful. the story felt a little clunky in places but overall ensnared my attention and in the end it did leave me looking for the further adventures of the protagonist. definitely going to be on the lookout for the next story, and maybe it will be longer - something this probably could have been. but overall I really enjoyed it and would definitely recommend it to fans of noir and paranormal.